The most sensible people follow the unwritten golden rule to breakfast like a king, lunch like a prince and dine like a pauper. But me I am the exact opposite. And no it’s not because I don’t know, it’s because my body is now accustomed to the unfit routine. With my mornings so chaotic, breakfast is the last thing on my mind. In between chores, preparing lunch and getting the household ready for the day I barely have time to breathe, forget about sitting by the table sipping tea and eating breakfast. Sometimes at best I grab a paratha or a sandwich and on the go take bites to sustain my hunger pangs. Oh yes, my body does call out for its share of nutrition and well being. However now this needs to change. Days on which I sit and indulge in some quality time with my breakfast I feel refreshed and energetic. I cannot overlook the importance of amazing nutrients like calcium, iron, vitamin B and fibre I get from the delicious spread. I can clearly see the difference in myself. I’m headed to check out what I’d love to try to whip it up too. Those are some great recipes and I would love to try them. However I’m going to leave the regular Kellogg’s and fruit with milk for later when I’m too bored in the kitchen as they are simple to make. And I’m going to try some out of the way recipes to indulge in my oh-so-interested-in-cooking phase. 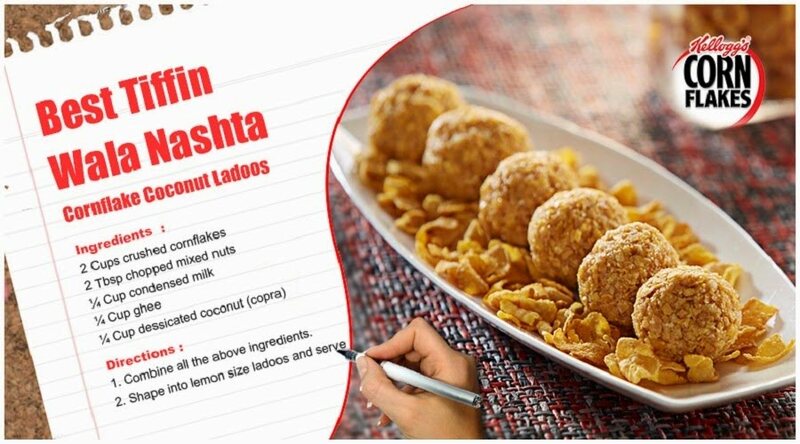 Cornflake Coconut Ladoos; ladoos filled with goodness for you to gobble. 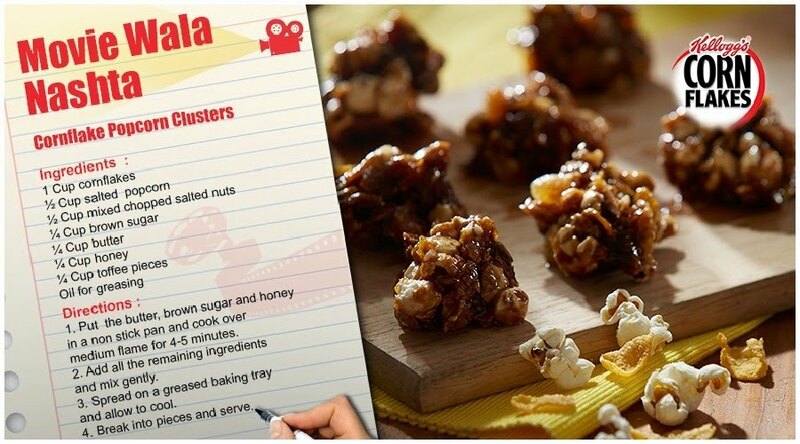 Cornflake Popcorn Clusters; bursts of joy, power-packed with health. 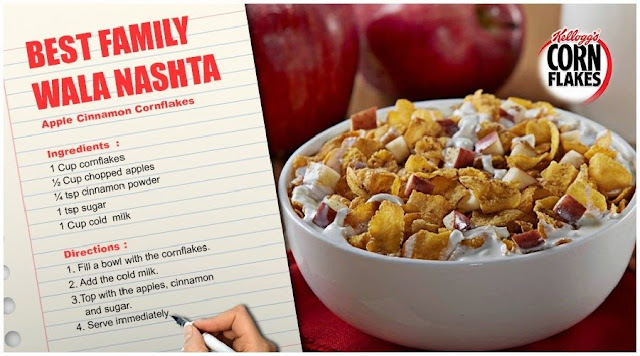 Apple Cinnamon Cornflakes: Cinnamon breakfast filled with the goodness of apples. Isn’t that fun, easy and so very tasty? Oh yes. Cannot wait to try these. And for those who still are lazing around, indulging in breakfast has long term benefits and can help reduce obesity, high blood pressure, heart disease and diabetes. Apart from the health benefits, breakfast is a perfect opportunity to start the day together as a family and connect with each other before jumping into your day-to-day activities.